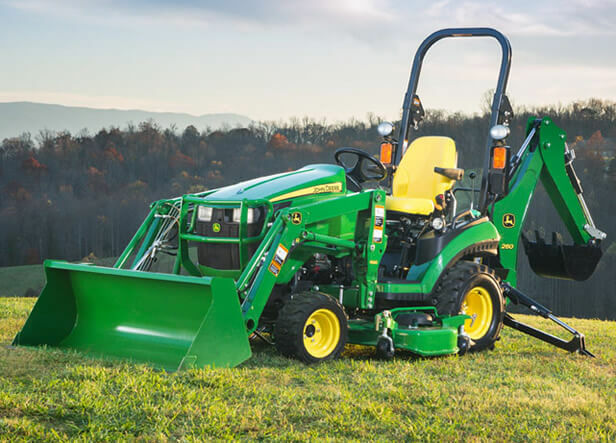 Take a look at the comfort and convenience comparisons between the John Deere 1 Series vs the Kubota BX Series of tractors. A comparison of the 1 Family AutoConnect Drive-Over mower deck vs the Kubota BX drive-over mower deck. A review of the drive-over mower deck on the John Deere 1 Family vs the Mahindra eMax series. Take a look at the loader lift capacity comparisons between the John Deere 1025R vs the Kubota BX Series of tractors. See the hitch position control comparisons between the John Deere 1025R and Kubota BX. Watch a review of the loader attach-ability differences between the John Deere 1025R vs Kubota BX LA240.